Are you a girl or young woman living in Leeds? Do you want to meet other young women? 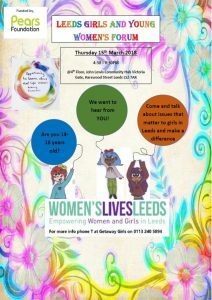 Have you got something to say about being a young woman in Leeds? If you answer YES to any of these questions then you should come along to our next Girls Forum on Thursday 15th March 4:30-6?30pm @ John Lewis Community Hub, Victoria Gate, Harewood Street LS2 7AR. A great opportunity to come and talk about issues that matter to you – maybe your social life, accessing services such as sexual or mental health, meeting new people, trying new things or anything else that matters to you! The event is free, open to all girls aged 13-18 years. There will be activities and games, and refreshments will be provided. If you have any questions or want some more information contact T at Getaway Girls 0113 240 5894.